Marketing yourself as a bilingual job seeker is pretty straightforward. On your resume, mention your language skills in your summary and highlight any relevant formal education or work history. Prospective employers like details and data, so make sure to include the number of years you’ve been speaking your second language, the way you acquired it (through study, from growing up in a multi-language household, or living abroad, etc. ), and any other information that will make you stand out. Keep in mind that “bilingual” means fluent in two languages. The conversational Spanish you picked up on your vacation won’t cut it. True fluency involves mastery of grammar and pronunciation. If your language skills are an essential function of the job, be prepared to prove your proficiency. 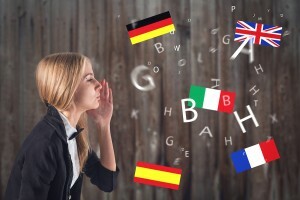 Career development consultant Graciela Kenig states, “Without a doubt, being bilingual increases employability.” According to Kenig, Spanish has become the unofficial second language of the United States, and finding candidates who speak the language fluently has become a priority for many companies. However, Spanish isn’t the only in-demand language. A global economy means opportunities for bilingual employees in many different languages. The 2005 Korn/Ferry International Executive Recruiter Index reported that Spanish was the most sought-after language (79 percent), but French (43 percent) and Mandarin Chinese (30 percent) were also popular. If you studied a second language in school, you may just be a little rusty. Try finding a foreign language club through Meetup.com to practice your conversation skills with native speakers. If you’re looking to learn a new language, check with your local community college for reasonably priced classes. You could also try RosettaStone software (or the free app Duolingo) to learn at your own pace.